We've enhanced our Fundriasing Program heading into 2018! LAKEWOOD, NJ - The BlueClaws have upgraded their fundraising program heading into 2018, crafting improved and varied offerings compatible with all types of groups and organizations. This year, the BlueClaws Fundraising Program has been expanded to include two versions that enable groups to raise money by buying and selling either 125 or 250 tickets. Plus, groups will have a chance to raise additional funds by volunteering in a FirstEnergy Park concession stand during a game. Buster's 250 Fundraising Program - In this program, groups purchase 250 tickets at $7 per ticket and re-sell them for $11, making $4 per ticket. A maximum of 20 volunteers can work a BlueClaws concession stand, earning $37.50 per person, an additional $750 for the group. Through this program, groups can earn $1,750, or more with additional tickets. RipTide's 125 Fundraising Program - In this program, groups purchase 125 tickets at $8 per ticket and re-sell them for $11, making $3 per ticket. A maximum of 20 volunteers can work a BlueClaws concession stand, earning $31.25 per person, an additional $625 per person. Through this program, groups can earn $1,000, or more with additional tickets. Participation in the programs outlined above also gives groups the opportunity to take advantage of additional exclusive opportunities. Youth Sports Organizations - Youth Sports Organizations that participate in the BlueClaws Fundraising Program will receive a Pre-Game Parade, the Future BlueClaws (up to 18 players run on the field with the BlueClaws for the National Anthem), Clawstars of the Game (up to 30 players can play catch on the field prior to the game), and a First Pitch for up to two members of the group. Additionally, the BlueClaws will purchase a sign at the organization's Little League field (Program A). 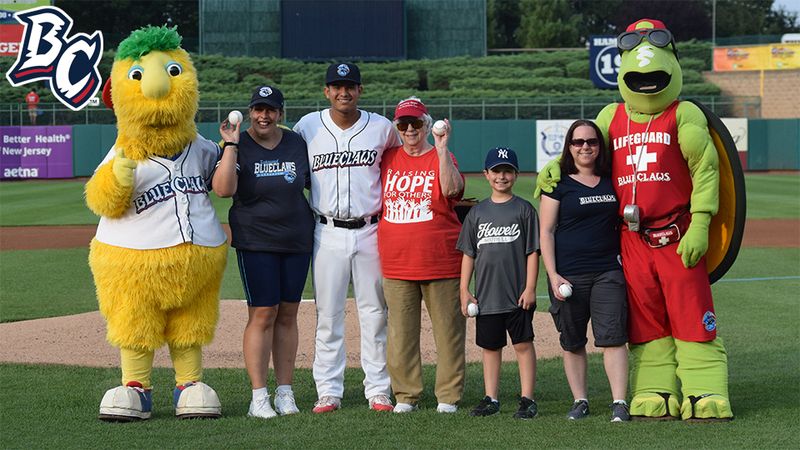 Schools - Schools that participate in the BlueClaws Fundraising Program receive a Pre-Game Parade and a ceremonial first pitch. A school chorus can sing the National Anthem or God Bless America, plus the school band can perform on the field before the game. Additionally, Buster will attend an assembly at the school. Dance & Entertainment Organizations - These groups will receive an on-field performance before the game and a table on the concourse to promote their studio and additional programs. Any pre-game performance will be posted on the BlueClaws Facebook page shortly after the performance. For additional information on the BlueClaws Fundraising Program, contact a representative by calling 732-901-7000 option 3.